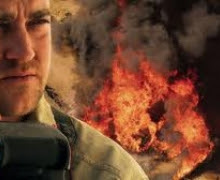 THE DEVIL CAME ON HORSEBACK exposes the tragedy taking place in Darfur as seen through the eyes of an American witness who has since returned to the US to take action to stop it. Using the exclusive photographs and first hand testimony of former U.S. Marine Captain Brian Steidle, THE DEVIL CAME ON HORSEBACK takes the viewer on an emotionally charged journey into the heart of Darfur, Sudan, where an Arab run government is systematically executing a plan to rid the province of it’s black African citizens. As an official military observer, Steidle had access to parts of the country that no journalist could penetrate. He was unprepared for what he would witness and experience, including being fired upon, taken hostage, and being unable to intervene to save the lives of young children. Ultimately frustrated by the inaction of the international community, Steidle resigned and returned to the US to expose the images and stories of lives systematically destroyed. Ricki Stern is a director, producer and writer whose films have shown on HBO and PBS. Ricki is the director and co-producer of the award winning In My Corner, a documentary film on the world of amateur boxing and the lives of the young men who train in the South Bronx. The film was nationally broadcast as part of PBS' award winning documentary series P.O.V. (Point of View). She directed and produced the EMMY nominated Neglect Not The Children, a documentary about a Harlem based youth program. Neglect Not The Children was hosted by Morgan Freeman and nationally aired on PBS. Ricki’s producing credits include the HBO’s series on forensic science "Autopsy I, II, IIIÓ and "Murder 9 to 5," on workplace violence. Ricki is the author of a children’s book series “Beryl Bean: Mighty Adventurer of the Planet” published by HarperCollins. She founded Break Thru Films, inc. in 1990. The company is currently working on the feature film version of Darryl Hunt’s story. Annie Sundberg is director and writer for film and television. She produced the independent feature film Tully, nominated for four 2003 IFP Spirit Awards (Best Film, Best Screenplay, Best Debut Performance, Best Supporting Actor). Tully screened at Toronto and London Film Festivals, and received Best Film at eleven festivals, including the Los Angeles Film Festival. Recent television directing credits include “Trailer Fabulous” for MTV. Prior to that, she directed the pilot for the series “Behind the Bash with Giada DeLaurentiis” (Food Network). Annie was Series Producer on “Family Plots” (A&E) following a family run funeral parlor in San Diego. Additional producing credits include a four part series on the Mayo Clinic for Discovery Health (2004) and the 1996 Academy Award and Emmy winning One Survivor Remembers, a co production of HBO and the U.S. Holocaust Memorial Museum. She was co-producer of In My Corner, a feature documentary film on the world of amateur boxing and the lives of young men who train in the South Bronx, which premiered nationally as part of PBSÕ award winning P.O.V. series (1999). She is currently at work on her first screenplay. "A powerful, incisive film. You will be moved." "No one can doubt the power and conviction of its message." "Powerful, impressively directed and desperately moving documentary"
"Makes a devastating point about the need for both the public and politicians to engage and does an excellent job of conscience raising"
"The Devil Came On Horseback deserves to be watched and - more importantly - acted upon"